I enjoy eating right and exercising and like so many others, struggle with overeating, but I think I am winning the battle. I used to think the only way to lose weight was to cut out all sugar and carbs. But that will just lead to binging later. I think a lot of women have a fear of all starches. So what I am trying to say is, you could do a series of snacks or recipes or something with the theme that Carbs are Not Evil!!!! I am searching for that healthy amount of the right kind of carbs. Yes, I hear you. I know that the high protein diet is a popular one that casts carbohydrates as the enemy to weight loss. The problem is that it just isn’t that simple. Carbohydrates are the body’s main source of fuel and are NECESSARY for our organs to function properly. When you cut out a nutritional source that your body needs - what do you think is going to happen? My guess is that you are going to start to crave the nutrient that you are missing. Are there evil carbs? No. Are there better carbs than others? Yes! Here are some examples of carb packed foods to use for treats: donuts, candy, soda, white bread, sugary cereals. 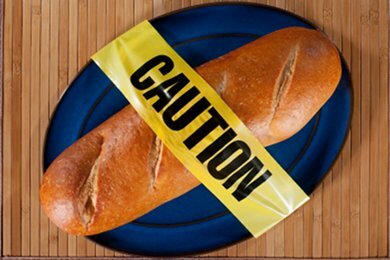 There are so many forms of cheap and sweet carbohydrates that are surrounding us all the time. These “junk food” carbs break down easily into sugar in our bloodstream and are contributing to nationwide epidemics of diabetes and obesity. This is why carbohydrates get a bad rap. My approach is to eat the better carbohydrates and enjoy them. Great carbohydrate sources (which your body NEEDS) are whole grain breads or pastas, vegetables, fruits, and beans. Now I am going to put on my cape and share something fairly obvious. Each of us needs different amounts of carbs, protein, fiber, etc. to function. The key here is to find the balanced diet that works for you. You can experiment with the levels of macronutrients to find what proportions make you feel great! Is Organic Produce More Nutritious Than Conventional Produce? My favorite observation about carbs: I always like to tell people: forget low-fat, low-carb, start thinking low-processed. I think it is all about balance. Healthy carbs - yes. Deprivation - no. Articles like this, pointing out that there are good carbs and showing us why our bodies need them is a huge help for those who struggle! I agree with the comment above... through my 100 lb weight loss journey I have avoided processed foods. I try to get a healthy intake of complex carbs like whole grains, fruits, and vegetables. Ditto the previous posters! I know I do much better at maintaining my weight and health when I eat mostly whole foods and fewer processed items. I tell people this all the time! Yet, even when I tell them the basic chemistry of their body, they insist I'm wrong and that eating carbs makes you fat. Your body runs on glucose, plain and simple. It needs other nutrients too, but glucose is what powers a lot of your cellular processes and - the big one - your brain. Also, if you take a glucose solution (or syrup) and let it sit, over time some of the glucose turns to fructose. It's a completely natural chemical reaction. One thing that makes me wonder is when people are so afraid of fruit because of the "sugar". Would you rather eat an apple or the cookie?? I know too much of anything (even fruit) isnt good but not eating druit intentionally becasue of the sugar makes no sense to me. Is the fruit processed the same way in our bodies? Carboydrates need to be eaten in moderate amounts. They do convert to sugar. As a person at risk for diabetes based on family history, my physician recommends limiting carbohydrate intake. I don't think fructose us what people are bothered about, because, yes it occurs naturally in fruit! It's high fructose corn syrup which IS bad for you. 1. It's more than likely that its made from GMO corn, so yum, drink up those pesticides! 2. Though the on paper chemical composition looks just like glucose, it doesn't behave the same. It actually turns of the receptors in your brain that tell you your full. 3. There is a really great ad campaign trying to convince you otherwise, but just remember, they just want you to buy the product, not educate you, because high fructose corn syrup is in SO much processed food. Eating is all about balance. I'm a Type 2 Diabetic and if I stop eating carbs, I'll have low blood sugar in no time. There's no all bad or all good in food. Also, the fructose turning off receptors thing is a myth. If that were true, eating a piece of fruit would make you hungrier, not signal that you'd eaten and were now full. The reason you feel hungry soon after eating only fruit is it's mostly sugar and carbs, which your body digests very quickly. It has nothing to do with fructose "receptors". Try reading "The Starch Solution". I'm adopting this way of eating and have been really successful. Dr. John Mcdougall endorses eating carbs because bodies need them. Love this post! Everything in moderation. I like the comment about processed foods too. I am really trying to limit the amount of processed foods in my family. I get tired of people wanting to not eat carbs but ignoring that the unhealthy ones are the enemy! GREAT ARTICLE! I wrote a blog where I teach people to eat "God's Carbs" and when you do you are safe. I also linked back to this article for the recipes. My girls are always looking for those. Thanks! The important thing is to know how many carbs you should have per day (the ratio of daily caloric intake should be about 20-25%. The thing is that carbs are "hidden" in things you wouldn't even think of (fruits and vegetables carry ALOT of carbs) and they are good carbs. However, I would highly recommend that people track everything they eat for a few days and they would be surprised at how fast the carb count rises even before adding breads, grains, pasta, etc. So no, Carbs are not evil, but it is educating yourself about where carbs are hiding in the good real foods (i.e fruits and veggies) and you get all the carbs you need from those sources. I say, if my carb limit (for me and my weight loss goals - no this number is not for everyone) is 50 grams/day. I meet that goal by eating avocado, fruits, nuts - and don't need the grains that "normally" come in more processed foods anyway. My husband was on a low carb diet for about a year-(cooking was a nightmare-I wasn't on that diet) He felt awful all of the time, ended up with an ulcer that was totally unrelated to his diet (aspirin overuse for pain), but it got him thinking about his diet-the good carbs were added back in, the weight has not come back on and I am a much happier camper with what I can cook now! Whenever there's an argument about carbs I always reply with: "There are a handful of countries where people live longer than anywhere else on the planet. In each of those cultures carbs are part of their diet." The problem is that even with the good carbs/bad carbs argument, most still eat WAY more carbs than their body needs. I eat minimal carbs and get them mostly from green veg, nuts, seeds. As a general rule (my lifestyle), I avoid all processed foods, sugar, bread, grains, beans, most fruit & juices, rice, pasta, starchy veg. It is not difficult to maintain this lifestyle - my weight came down and I can maintain it, as well as, better cholesterol, sugar, and blood pressure readings. I have energy, and don't CRAVE sugar or feel hungry. There is so much hidden sugar/carbs in the american diet...try reading jarred spaghetti sauce! I either look for a brand that has 2 net carbs (carbs less fiber) or make my own, because it can be hard to find/avoid sugar & high fructose corn syrup in sauces. People with diabetes, insulin resistance, have an apple shape (like me - skinny arms/legs & round around the middle, or high Triglycerides need to especially watch their intake. I agree with the comment about keeping a journal - most would be amazed by how many carbs they consume in a day.